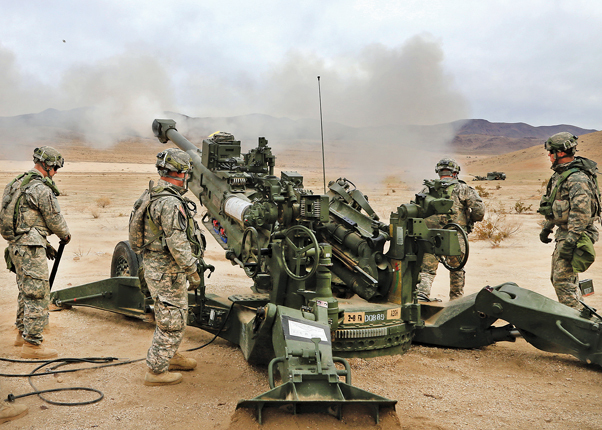 Soldiers of Alpha Battery, 2-8 Field Artillery, 1st Stryker Brigade Combat Team, 25th Infantry Division, handle a 155 mm artillery shell to be used in a M777 howitzer during training here. The 1st Stryker Brigade Combat Team “Arctic Wolves” from Fort Wainwright, Alaska conducted an 18-day training here that concluded Feb. 5. 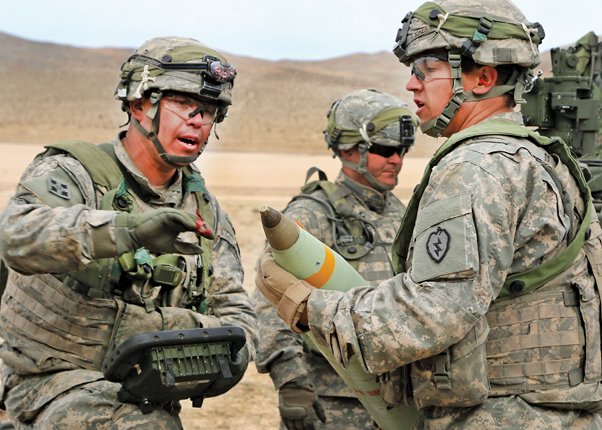 The brigade, part of the 25th Infantry Division, was provided with four additional days in “the box” to hone its war-fighting skills. In all, the brigade was scheduled to be here just over five weeks. Rotations at the National Training Center are typically four weeks with 14 days in the training area. Though there is plenty of land for training in Alaska, the NTC is uniquely resourced to mass training and evaluation support at one location to sustain a brigade-sized full spectrum validation. 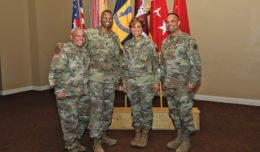 The NTC conducts tough, realistic, unified land operations with unified action partners to prepare brigade combat teams and other units for combat, according to Adams. 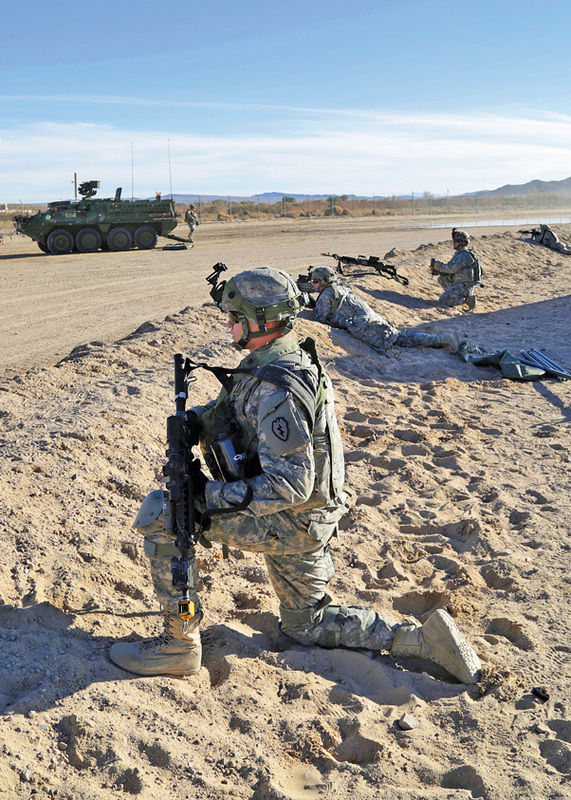 Every unit that trains at the NTC improves throughout the rotation. Additional repetitions afforded by the 18-day training model provide additional time for the unit to depart the NTC at a much higher level than when it arrived. Deputy commander of the 1st SBCT, Lt. Col. Mick Braun, explained that the rotation was an opportunity to seriously stress systems and capabilities of the brigade. The extended training also allowed the brigade more time with integrated enablers, such as: an aviation battalion with AH-64 Apache, UH-60 Blackhawk and CH-47 Chinook helicopters, and; an armor company with M1-A1 Abrams tanks. 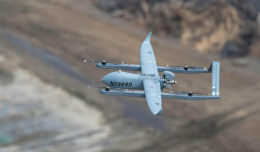 “We also have different signal assets assigned, military information support operations and civil affairs elements from not only regular Army, but also from Reserve and National Guard units not available to us in Alaska,” Braun said during the rotation. United States Army Alaska Deputy Commander Col. Shawn Reed agreed the “Arctic Wolves” were part of a larger training model incorporating National Guard and Reserve units. 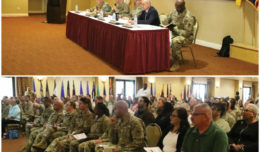 “This is a rotation designed for one brigade combat team, but the fact of the matter is, this training is on a much larger concept of total Army integration,” Reed said. 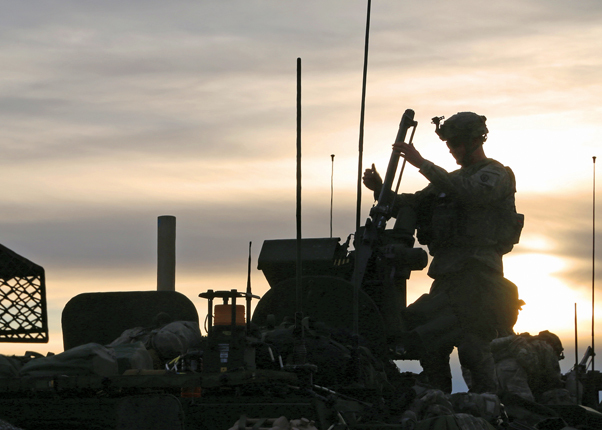 A Soldier with 1st Battalion, 24th Infantry Regiment, 1st Stryker Brigade Combat Team, 25th Infantry Division, prepares equipment on a Stryker vehicle at sunset at the start of decisive action rotation 15-03 here. Second Platoon, Charlie Company, 1st Stryker Brigade Combat Team, 25th Infantry Division, provides security at a rear entry control point of a staging area during training rotation 15-03 at the National Training Center. Soldiers with Alpha Battery, 2-8 Field Artillery, 1st Stryker Brigade Combat Team, 25th Infantry Division, fire a M777 howitzer during decisive action rotation 15-03 here, Jan. 20. 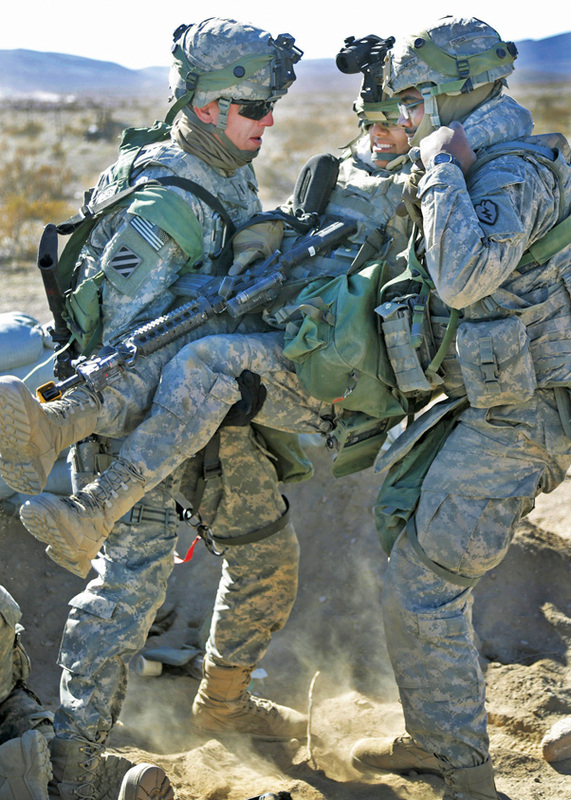 Two Soldiers of the 25th Brigade Support Battalion, 1st Stryker Brigade Combat Team, 25th Infantry Division, move a simulated casualty to a collection point during a training rotation here, Jan. 21. 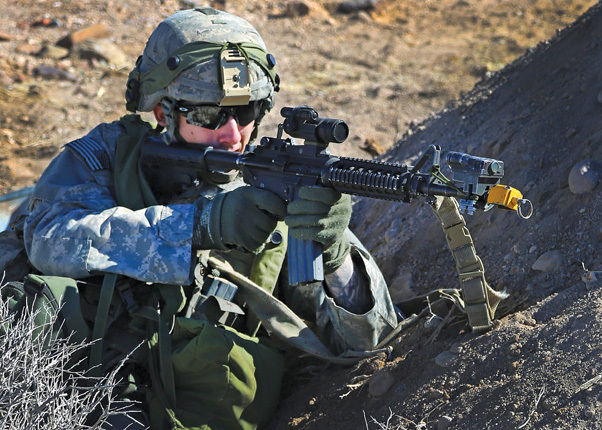 A Soldier with 25th Brigade Support Battalion, 1st Stryker Brigade Combat Team, 25th Infantry Division, aims his weapon while taking a fighting position during decisive action rotation 15-03 here, Jan. 21. 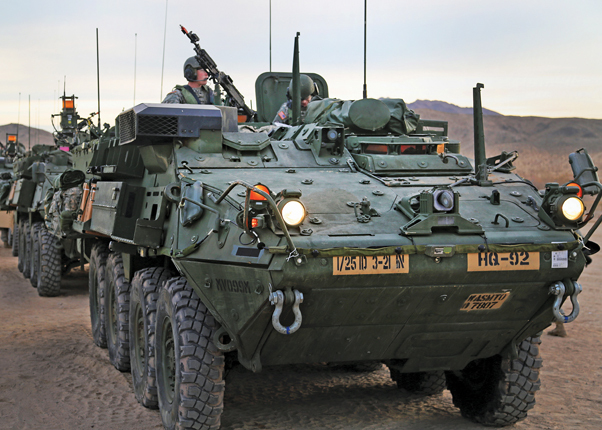 Soldiers with 3rd Battalion, 21st Infantry Regiment, 1st Stryker Brigade Combat Team, 25th Infantry Division operate Stryker vehicles during training rotation 15-03 here. There are eight variants of the Stryker, which can weigh between 20-23.5 tons and reach a top speed of 60 miles per hour, according to the Army’s Program Executive Office Ground Combat Systems. The Stryker enables the Army to respond to urgent operational requirements using rapidly deployable, agile and strategically responsive combat support vehicles.